What is Arbor Day? It is a nationally celebrated observance that encourages tree planting and care. Founded by J. Sterling Morton in 1872, it is celebrated on the last Friday in April. 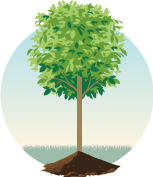 Stone County Soil and Water Conservation District is offering to the public free tree seedlings in honor of this day, April 26th, 2019. The trees/shrubs are 1-3 yr. bare root seedlings and will be available on a first come, first serve basis while supplies last. We will have approximately 400 seedlings including: Dogwood, Witch-hazel, River Birch, Pitch Loblolly Pine, Norway Spruce, Eastern White Pine, Ninebark, Rose Mallow, Silver Maple, Redbud, Tulip Poplar, Silky Dogwood and Spice Bush. These are natives to our area. You can look these up online to view images. Limitations may apply. Planting instructions will be available. Pick up your trees at 108-B Cortney Lane, Crane Mo on April 26th. For more information, call us at 723-8389. The week of April 28th is National Association of Conservation Districts (NACD) Stewardship Week. 2019 marks the 64th year to celebrate NACD Stewardship Week and honors the theme “Life in the Soil: Dig Deeper.” It is essential that each of us adopts good conservation habits so that we can keep our soil and water resources safe and productive now and for future generations. Stone Co. Soil and Water has been scheduling in the schools a 4th grade soil demonstration where students make their own soil profile and discuss the topic of soil and the life beneath our feet.